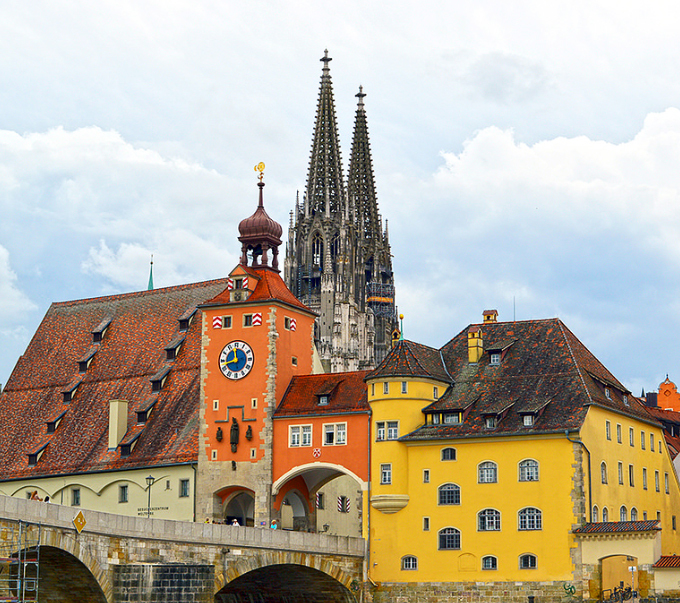 Regensburg, a Bavarian city on the Danube River in southeast Germany, is known for its well-preserved medieval core. The 12th-century Stone Bridge, a 310m-long icon with 16 arches, crosses the river to the old town. The 13th-century Regensburg Cathedral, a twin-spired Gothic landmark, is home to the Regensburger Domspatzen choir. Walhalla, a Parthenon replica just east of the city, honors illustrious Germans. Some people call Regensburg “Italy’s northernmost city”, others prefer to describe it as “Germany’s medieval miracle”. It’s quite simply a city to love and love to be in. 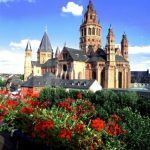 The best-preserved medieval city in Germany, situated at the northernmost point of the Danube River has a special charm. Two millennia of history have remained alive here. The most Italian city north of the alps also offers world renown sights such as Porta Praetoria, the gate to the Roman Castra Regina, the Old Stone Bridge and St. Peters Cathedral. Visit the Old Town Hall with Reichssaal which for 200 years served as the seat of parliament for the Perpetual Imperial Diet and with the original Tourture Chamber of the middle ages or the Palace of the princes of Thurn und Taxis – the family dynasty that founded Europe´s first postal service and now part of the Bavarian National Museum. 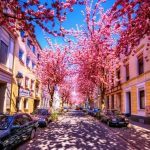 To fall in love with this town, just stroll through the narrow streets and alleys of the old town and you can see what the city once was and still is today. In contrast with many other city centers, the residents have not been ousted by office-workers. The historic city center has a healthy mixture of shops, offices, flats, hotels, restaurants and cafés. 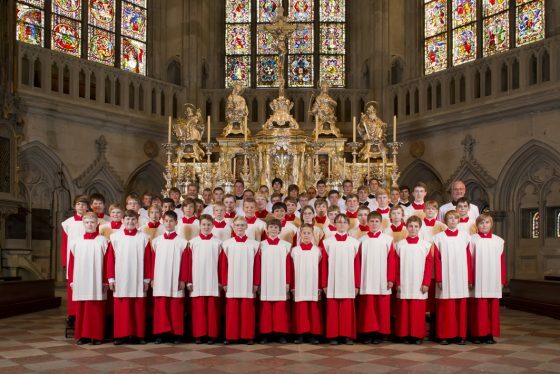 Listen to the delightful voices of the boy´s choir of Regensburger Domspatzen, taste the delicious sausages at the Historic Sausage Kitchen or take a boat trip on the Danube River. You will discover that history can be fun. The city was first settled in during the Stone Age, later the Celts named it Radasbona and in the year 90 A.D the Romans built a fort here. During the reign of Marcus Aurelius around the year 179 A.D. they built a new fortress called Castra Regina or fortress by the river Regen. In the year 530 A.D. it became the capital of Bavaria and lasted until the 1245 when it became a free Imperial city. 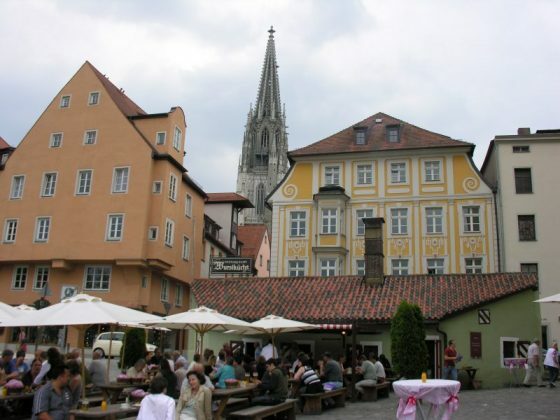 In 2008, Regensburg formally got its UNESCO acknowledgment as the best-preserved medieval city. The heritage ensemble covers more than half of the 1,500 recognized buildings in Regensburg. Regensburg’s Old Town has been able to reserve its original medieval outline since the 14th century. The Old Town survived the Second World War in exceptionally good shape. 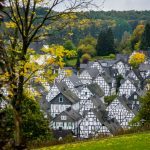 As a result, but also due to restoration efforts starting in the 1970s, a large number of old buildings have been preserved well, which contributes to the historical integrity of the town and the effective protection of important views of the property. Luckily, the planned demolition of the historical structures in Regensburg and transformation into modern ones in 1960 was not carried out. Instead, the people have been renovating and maintaining the old infrastructures’ design since 1970. 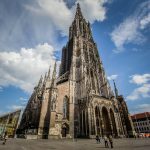 Regensburg gives you not only a medieval stance but as well as innumerable selections of awesome experiences when you visit the city, such as the following. The 16-arch old stone bridge is a masterpiece of medieval engineering. It was constructed in the 12th century and crosses the Danube river. 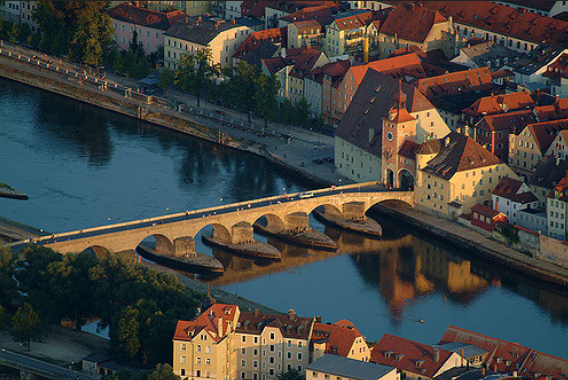 For 800 years it was the sole bridge of Regensburg until the 1930s when they built the Nibelungen Bridge. It was built in only 11 years from 1135-46. Throughout history many important figures have used the bridge to cross the Danube. Louis VII of France and his army used it to cross the Danube on their way to the Second Crusade. It was also the model bridge for all the bridges built in the 12th and 13th century across Europe. Some of those are the Augustus Bridge in Dresden and the Judith bridge in Prague. 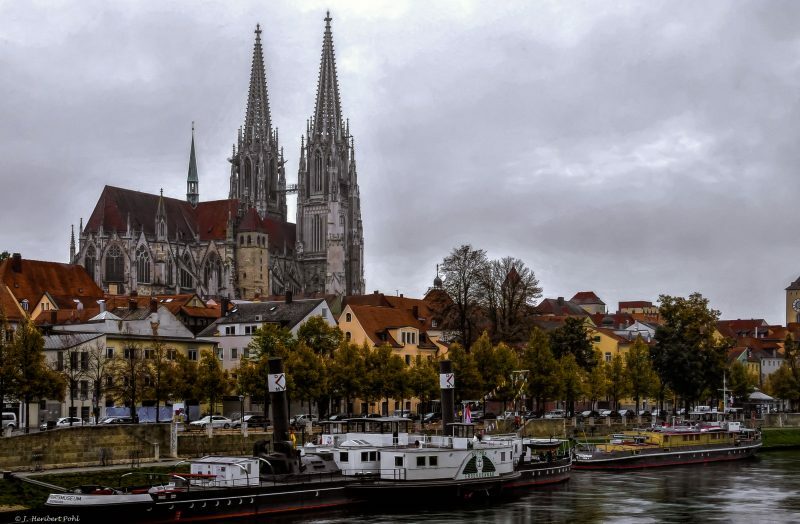 Regensburg Cathedral dominates the city’s skyline and is close to the banks of the Danube. Dedicated to St Peter, it is one of the top places to visit in the city and is a perfect example of Gothic architecture. 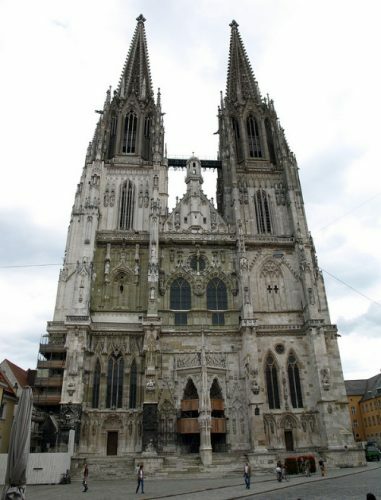 It is also the seat of dioceses of Regensburg and has a consideration history. The first church on the site dates to around 700 when St Boniface choose the former North Gate of the old Roman fort as the location for the bishop’s seat. The cathedral has seen some damage over the centuries and was burnt down twice during the late 1100s. The rebuilding saw the magnificent Gothic building that I visited. There were some later additions such as Baroque frescoes commissioned by Ludwig I of Bavaria and a major restoration project took place just after the turn of the millennium. In 179 Marcus Aurelius built the Roman rectangular fortified town of Castra Regina for the Legio III Italica and the town quickly became an important location at the most northerly part of the Danube. 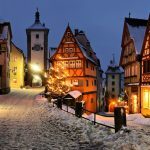 This fortified town is roughly the area now known as the Old City or Altstadt. Many parts of the Roman walls and buildings can be spotted around the city and incorporated into more modern buildings. The East Tower of the Porta Praetoria is an example that can still be seen – this was part of the entrance to the legionary camp where there were two massive towers. Porta Praetoria was the north facing gate and was discovered in 1885 during renovation work. In fact, the arches had served as a city gate right up until the 17th century. This and the Porta Nigra, the northern city gate, are the only two remaining Roman gates north of the Alps. 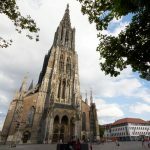 Regensburg has another claim to fame that will interest food fans – it is the site one of the oldest continuously open public restaurants in the world. 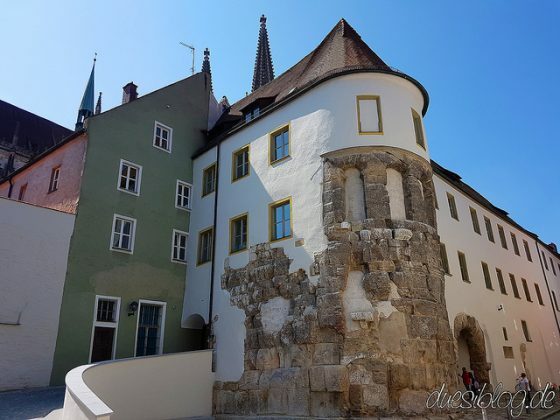 The Historic Sausage Kitchen (Historische Wurstkuchl) of Regensburg opened back in 1135AD when it was the ‘cookshop near the crane’ and served food to workers building the Regensburg stone bridge. Later workers from the cathedral project came for their meals. The current building dates from the 17th century but there is clear evidence for the previous restaurants on the spot. Around 1800, it became known for its ‘gesottenes Fleisch’ or boiled meat and in 1806, it began to specialize in sausages. It opens daily from 8am to 7pm and serves around 6,000 sausages a day including regional specialties. Regensburger Domspatzen or the Cathedral Sparrows is the all-boys chorale whose existence started in 975 AD. Yes, 975! 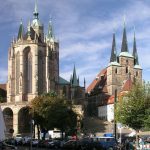 It was the Bishop of Regensburg, St. Wolfang who initiated a catholic school thousand years ago, focusing on the conduct of musical workshop where students should sing during the services in the Cathedral. However, the current popularity of the singing group started only in the middle of the 19th century through its Musical Chief Joseph Schrems Iaid. 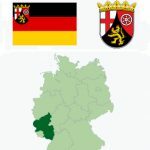 Several leaders of the Catholic Church had expressed their amusement for the Domspatzen, whose music focuses on European theme and touches the world’s harmony. Every Sunday and special occasions such as Christmas and Easter, the all-boy chorale is bringing a traditional music to all the visitors of St. Peter’s Church.